How much is that cystectomy in the window? There are regularly stories (either in the news or viral) about how much American healthcare costs. I’ve blogged in the past about some of the causes. British healthcare is free at the point of delivery, so the patient doesn’t see the cost and people don’t know how expensive healthcare should be. But British internal prices are public information, so it’s easy to see approximately how much things cost in a well-run health service. The prices do, however, need some interpreting and the government’s “simple guide” runs to 72 pages. I’m going to explain the system in a single (long) blog post. And then I’m going to take estimates of how much a British hospital bill would get for each of the linked hospital costs. The current costs are here (next year’s includes a 3.8% “efficiency saving” (read: underfunding)). NHS pricing is based on the largest operation for the hospital visit (also called a spell). It is assumed that if you have major open heart surgery you will have X-rays, drugs, and a range of other treatments – and it’s all rolled into the price. This makes working out the UK price for things easy. You need the following factors to estimate how much something would cost in a British hospital. I’m only simplifying the system slightly here. How the patient was admitted (either elective “You’re going to need this soon – we’ll book you in in a few weeks” or emergency “You need this this minute.” A&E/ER admissions are emergencies, of course.) Or even done as an outpatient procedure. What was done for them in A&E. There are a few things the above won’t tell you; Critical Care stays and transplants (amongst others) are negotiated locally (and should be available to a Freedom of Information request). But almost all the tariffs are on the national prices spreadsheet and the local tariffs are on the Market Forces Factor spreadsheet. I could run through how to use the World Health Organisation’s ICD-10 codes for the diagnosis, the OPCS 4 procedure codes (and point you at a lookup), and suggest you install the payment grouper. But frankly it isn’t worth it. 99% of the time you can get what you need from just looking at the tariff spreadsheet. I’ll illustrate with three case studies. Case Study 1: the $55,000 appendectomy. How much would it cost in the UK? We know the patient was admitted through A&E – so they were an emergency admission. I’m going to estimate high and say that in A&E they had a category 3 investigation with category 3 treatment. £163. (US cost for the ER: $2703 – ten times as much). A&E category 3 investigation, limited treatment: £163 (no surgery, drugs from the central supply). Emergency admission for PA29Z General Abdominal Pain: £573 (and I don’t think they bothered to do that). Total maximum: £736+ Market Forces Factor. Probably £163 + Market Forces Factor. And I thought taking the piss was the job of the Urology department. It’s as simple as that to look up the prices. And anyone should feel free to drop me a note whenever one of these overcosted bills goes viral or if they think working out what it would cost in the UK will help when trying to negotiate a medical bill to something sensible. 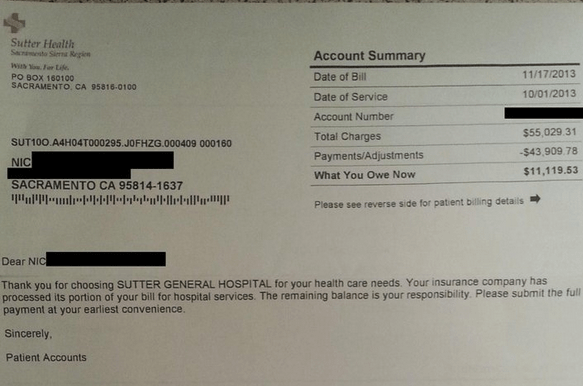 After writing this post I discovered more about what hospital bills in the US actually mean (always haggle them!) and did a more systematic comparison between US and UK prices. This entry was posted in Corruption, Healthcare and tagged debunking, ethics, nhs by Francis. Bookmark the permalink. But in the UK I doubt ‘general abdo pain’ in A&E would get (or need!) a CT scan – it would probably be observed for a bit, saving a huge amount of the US cost, as well as a generous helping of radiation! He almost certainly wouldn’t have had a CT scan in the UK – and almost certainly didn’t need one in the US either. But a CT scan shouldn’t be costing $6000 at the best of times – in the UK £672 is average for private care – and that includes admission and a substantial profit. This is another way the American system overcharges – unnecessary tests (that are part of the padding of the bill). There’s no incentive to do that in the UK – a CT scan wouldn’t be funded separately. What you would get now and what you would get if you were being charged for it, may well be two completely seperate things. Now, the CT scan is a drain on the resources of the hospital; in the future, it might produce revenue for the hospital (from you and your insurers). I think you might find that CT scans are offered more frequently. Hospitals don’t need to (or even want to) drum up much extra business at the moment. Most are bursting at the seams. We’d need more capital investment before that’s a serious worry. The one long post morphed into three, of which two are short and punchy (and the third is underlying data). I think this one should interest you. It is unlikely a CT scan would be done on the NHS for general abdominal pains. Unless he was quite unwell, a renal stone was suspected or a very tender abdomen that WAS NOT classical for appendicitis ( if appendicitis is suspected, do a diagnostic lap + proceed usually). Is it possible that some of this unnecessary testing is also a product of the US legal system? I don’t know the situation in the UK but here in NZ we have a “no fault” state insurer the Accident Compensation Commission or ACC) which means that (at least in theory) the state compensates people who are injured on the job or as a result of medical mishaps. As a result of this regime, New Zealanders don’t have the right to sue people if, as an example, the hospital overlooks an expensive and probably unnecessary test that might have found an underlying condition. As I understand it, if a US hospital overlooks something uncommon that turns out to be a serious problem later, they could be sued. I can see how this would drive people to do more tests than is usually necessary. I’ve actually gone into some of this in the past – and yes, the difference between suing the doctor and suing the hospital is important – but there’s also a difference in size of damages and need to sue. In the UK if a hospital overlooks something that turns out to be important and the patient is particularly upset they can sue and get direct damages. In the US they are very likely to sue – their future medical expenses need to be paid somehow and the damages include the cost of any future medical expenses that resulted because the patient rather than the NHS pays them. There’s also the fact that the average doctor graduates $170,000 in debt at 7% interest (In the UK it’s £20,000 – which will mostly be owed to the Student Loan Company who charge half a percent more than base rate interest and effectively take the money back as a marginal graduate tax (9% IIRC on earnings above the threshold). I think a big difference in the litigious culture is punitive damages i.e. in the US, the court can award money to the plaintiff to punish the defendant (if guilty). In the UK, not only is it harder to prove negligence, but damages are only awarded based how much the mishap will actually cost you. The craziest things I find on the bills you showed are the cost of investigations. Really, for a lot of them, the cost of the actual test is minimal – the cost is in the initial outlay of the machine. Google tells me a 64 slice scanner (a top of the range one) will cost 275,000 USD. A CT abdomen takes about 3 minutes and the scanner is taken up by a total of 30 minutes max with all the flaf, so 15 scans a day. You’ve made your initial outlay in 2 weeks, Same for the lab tests. Most are batch processed by machines using very little reagent. The profit margin is insane. You’re making one very important assumption there – that hospitals actually expect to get paid for anything like the amount of things they bill for. The draft of my next blog post has some numbers and case studies, but as a rule of thumb, hospitals only get paid for about 25% of the amount they bill for – so they pile things in and hope so far as I can tell. Even then, I think a sharp insurance company is just going to look at the CT bill and say “Ummm. no. You’re trying it on.” But individual patients don’t normally know enough to be able to do that.